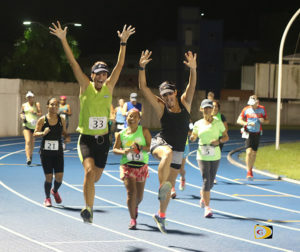 With Hurricanes Irma and Maria wiping out the 2017 fall calendar, road racing will return for the first time since July 19, with a College Classic Series fun run on Saturday, November 25, ahead of the 12th Deolitte and Ogier BVI Half Marathon on Dec 3, dubbed the Irmarathon and a 10K race called 10Kirma. Typically, the College Classic Series would run from September to November and the Ceres Juices 10K Series that began in June, would end in November. Saturday’s race will convene at 7 a.m. at the College in Paraquita Bay, with registration starting at 6:30 a.m. The Deolitte and Ogier BVI Half Marathon and 10K, will kick off at 6 a.m. on Dec 3 and offer a looped course starting and ending at the Tortola Sports Club. Registration will take place on Saturday, Dec 2, between 3-5 p.m. at the Tortola Sports Club. The entry fee of $20 will cover breakfast, drinks and a charitable donation to support Irma relief. In the spirit of the wild west proceeding Irma, there are no rules this year, however a few small details. No shirts, medals or other stuff that can be blown away with ease at the whim of Mother Nature. However, runners are encouraged to donate a suitable Irma recycled trophy that we will handed straight back out to winners and participants. The course offers two loops. On the first loop, exit the Sports Club, turn east along the dual carriageway, with a turn at Port Purcell Roundabout and run all the way to the Sensus Gym turnaround in Pieces of Eight, and return back to the Sports Club. The second loop, exit the Sports Club, turn right and head directly to the Sensus Gym and return to the start/finish. Runners can select the course of their choice and if they like hills, throw a few in along the route. There will be three water stops servicing runners going and coming. One will be opposite Peebles Hospital, the other at the Sensus Gym turnaround. Besides the individual race, there will be competition for the Corporate Cup at $20 per person on each team. There’s also the Fancy Dress segment and a prize for the person traveling the furthest.